A Abbas, A McMurtrie, A Guha, J Wootton. 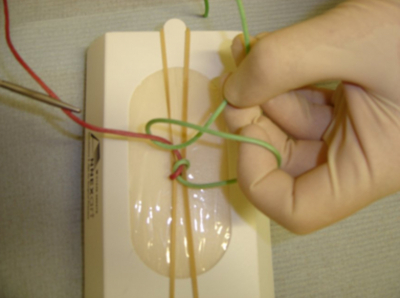 A novel modification of the standard surgical knot. The Internet Journal of Orthopedic Surgery. 2007 Volume 8 Number 1. 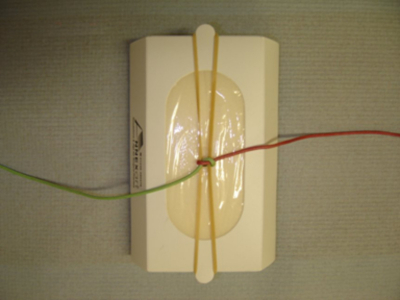 It is often necessary to control the tension of a surgical knot in order to prevent the first throw slipping while ensuring that the second throw is not so tight as to crush the tissues. In some instances this can be a difficult balance to achieve, particularly if operating alone where there is no assistant to hold the first throw while a second is being tied by the surgeon. 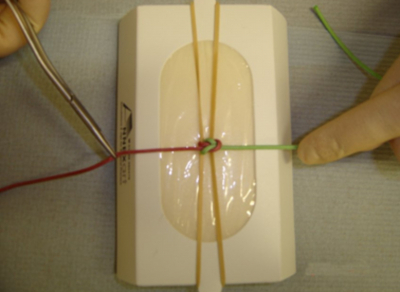 We describe a knotting technique that enables a single surgeon to effectively tension a knot using an instrument tie. 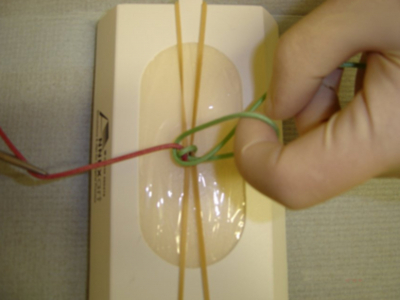 A standard surgeon's friction knot is tied as the first throw (Fig. 1). A loop is made as normal for the second throw of an instrument tie. The free end of the loop is held between the thumb and middle finger tips. 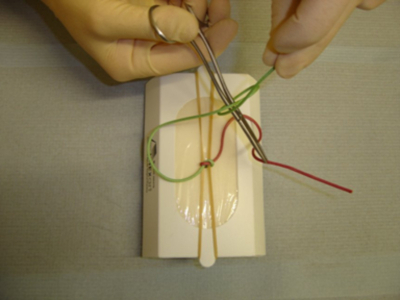 The needle holder is passed through the loop to grasp the other end of the suture (Fig. 2). If the loop is now allowed to quickly slip off the index finger tip whilst maintaining traction on the needle holder, the second throw tightens locking the initial throw (Fig. 5). Further throws can be added in the normal manner.